The Mars Suit is a project Michael Lye, RISD professor and NASA Coordinator, has been directing with several RISD students. Unlike the custom space suits that are made to fit each astronauts accordingly, this space suit is designed to fit people between 5' 2" to 6' 3". Not only that, while many space suit are designed to look nice and contain complex technology, we focus a lot more human factor into the suit design to make it be user friendly for the astronauts so they can wear it easily and comfortably. I've been helping the team with various 3D printing and laser cutting for templates and materials. 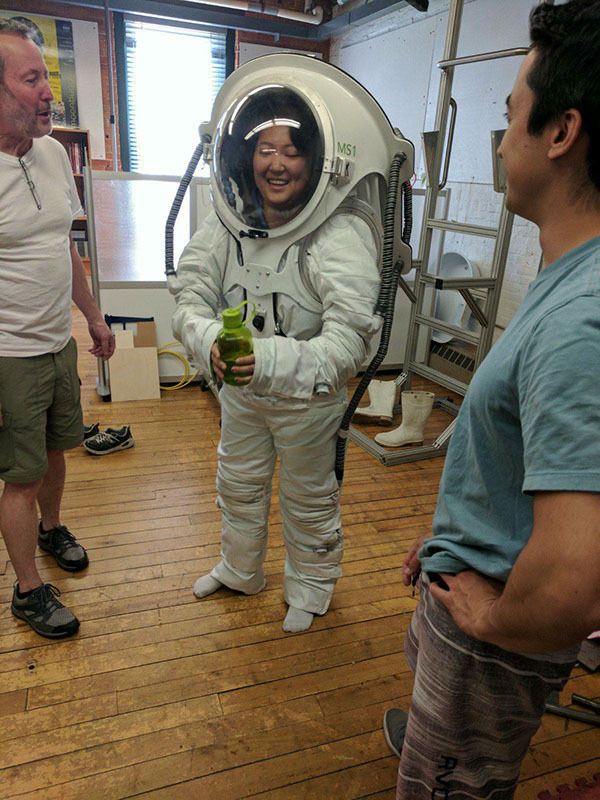 This summer, I got to be more involved in the manufacturing and maintaining the suit so it is ready for the HI-SEAS VI mission simulation. The finished suit will be sent to Hawaii at the end of the year so the astronauts can test it's durability and function in the simulated environment. Improving Air Duct flow of the suit. In order to bend a 1/16 thick steel tubing, we had to find a way to stuff the inside of the tube so that it keeps its structure when I bend them. We first annealed the metal and poured hot wax inside the metal and waited for it to cool. After cooling, I bent the metal to see if it kept its shape. The structure and strategy worked perfectly, we just need to make the curve radius smaller. The previous water vessel insulator for the suit was just a double foil insulation wrapped around the water bag. 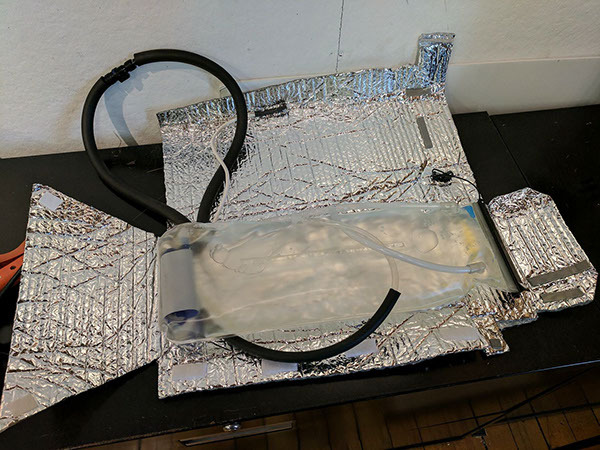 We needed a more firm structural casing for the water bag so that it stays in place even if the astronaut moves abruptly. We made foam models of the ideal shape we want the casing to look like and vacuum formed the shape over it. After the initial model was done, we tested its fit and found some minor changes that we need to make. The second model is currently being prepared for vacuuming. I conducted a few user tests on how people interacted with the suit when they were donning the suit. I found out that because there is no indication of front and back on the pants of the suit, many test users were confused as to which way the pants goes. We solved the problem by making slots on the aluminum ring of the waist and insert a visual sign indicating where the front of the space pants is. The visual signs were made out of colored acrylic, red indicating left and green indicting right. After making sure that the width of the acrylic is the same size as the flat end mill bit size, I machined MDF to create a slot to locate the aluminum ring on the Bridgeport. After the grooves were made and acrylics were placed, I made sure they were not interrupting the surface where the upper suit and the pants are attached.